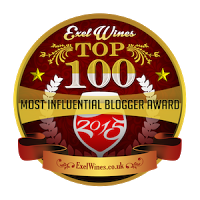 My little old wine blog was recently ranked #27 in Exel Wines' “Top 100 Most Influential Wine Blogs of 2015.” Without a doubt, I’m delighted and grateful to be in the company of so many other great sites, wine writers, influencers, and social media personalities. I know many of the people on the list and they are well deserving of the shout-out, position, and coverage. Keep tasting & trying new things, wine friends! I would like to send a double magnum-sized congratulations to everyone on the list. I would also like to sincerely thank my readers, friends, and wine peeps for their continued support. I started this blog back in 2006 and wine has been a most rewarding and interesting hobby. As we close the chapter of 2015, my advice remains the same: keep tasting and trying new things. I consider the ritual of seeing, swirling, sniffing, and sipping [and sometimes spitting] productive, and try to do it daily. Thanks again for the kind words, e-mails, tweets, DMs, messages, invites, IRL meet-ups and tweets-ups. Here's wishing you all a fun and wine-filled Christmas and Happy New Year. Let’s uncork and unscrew some fun in 2016! Click here to see the full Exel Wine listing.